Sago care is easy making it a great plant. The sago grows primarily outdoors, but makes a great indoor plant as well. 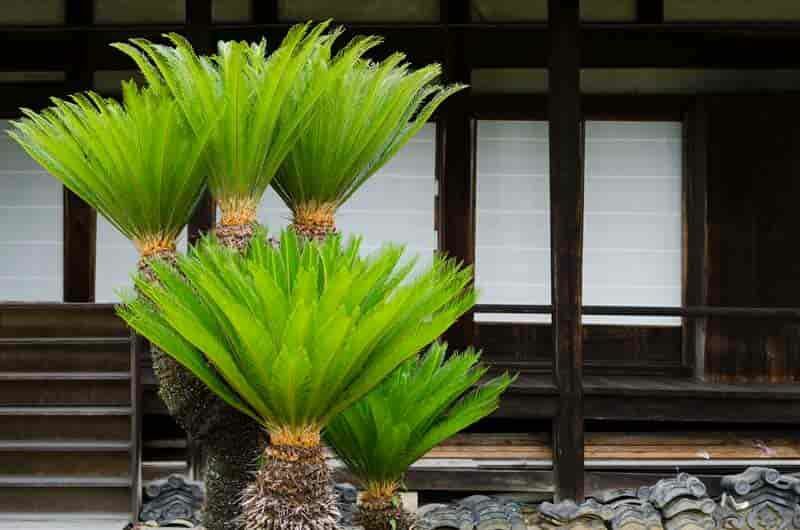 Commonly known as the "Sago Palm" they are one those plants that look like a palm but isn't a palm at all, it's a cycad. While sagos generally prefer full sun, they will tolerate shady areas as well. They prefer dry, well drained soils, excessive moisture will lead to root rot. With minimal care, these plants can last a lifetime. Annual fertilization is usually enough, but unusual yellowing of the leaves may indicate a magnesium or potassium deficiency. In this case iron and or Epsom salt spray can be applied at the suggested rates to the foliage, this will not undo the yellowing of the older foliage, but as new leaves emerge they should be a nice healthy shade of green. Cycad Scale is the biggest problem among sagos. It is present and can be active all year round in Florida. If left untreated it will kill the plant. Crawlers initially infest the trunk. Scale will also infest the cones, seedss, roots, and ultimately both surfaces of the leaves. Treat regularly with insect control and oils when possible. FOLLOW LABEL GUIDLINES. Spray the entire plant INCLUDING THE TRUNK. Sagos can withstand very low temperatures, down to 15 degreees for short periods of time as long as protection is given. Frost -proof blanket is the best option, but this doesn't gaurantee damage will not occur. Cut back on watering during winter months to allow plant to go semi-dormant. Dormancy is a must for healthy reproduction. In spring, cut back any unwanted growth as close to the trunk as possible, fertilize, and enjoy!